^ 1.0 1.1 John Berger, Provocative Art Critic, Dies at 90. The New York Times. 2 January 2017 [3 January 2017]. 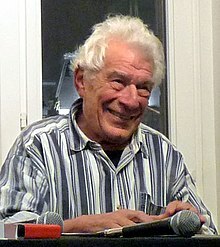 ^ 2.0 2.1 John Berger, art critic and author of Ways of Seeing, dies. BBC. 2 January 2017 [3 January 2017]. ^ John Berger, art critic and author, dies aged 90. The Guardian. 2 January 2017. ^ John Berger, pioneering art critic and author, dies at 90. Associated Press. 2 January 2017 [2 January 2017]. （原始内容存档于2017年1月3日）. ^ Booker prize-winning author John Berger dies aged 90. The Telegraph. 2 January 2017 [3 January 2017]. ^ John Berger obituary. The Guardian. 2 January 2017 [3 January 2017]. ^ Bürkle, Christoph. Johann Sebastian Bach: der geometrische Komponist, Issues 764–766. Niggli. 2006: 83. ^ Catherine Neilan. Berger picks up Golden PEN award. The Bookseller. 8 December 2009 [3 December 2012]. ^ Golden Pen Award, official website. English PEN. [3 December 2012]. ^ Oliver Seidl, Michael Leu. Vom Sinn des Sichtbaren. Doktorarbeit von Jochen Krautz, Verlag Dr. Kovač 2004, 412 S. Verlagdrkovac.de. 15 May 2010 [3 January 2017]. （原始内容存档于2015-05-03）.